Pop over to the thinkTankphoto blog RIGHT NOW for your chance to win thinkTankphoto’s new bag, the Trifecta, by entering the #MyTrifecta competition! Kevin and I have contributed our photos already to spur those creative cogs into gear. Good luck! The new thinkTankphoto Trifecta. Available now! Our friends over at thinkTankphoto have been hard at work and are releasing another awesome backpack to add to their already impressive range. The Trifecta Backpacks — with two variants being the Trifecta 10 for DSLRs and the Trifecta 8 for mirrorless cameras — have been designed specially for serious photographers’ three workhorse lenses: their ultra-wide, mid-range and telephoto zoom lenses. These innovative backpacks sling for side access from both the left and right. They are the perfect carrying solution for any shooter on the move who does not want to have to take off their backpack to access their gear. There are three points of access to your gear: the left, the right, and the rear. The rear panel opening offers complete access to gear. The slim silhouette is comfortable and appealing, and helps photographers easily navigate through crowds. 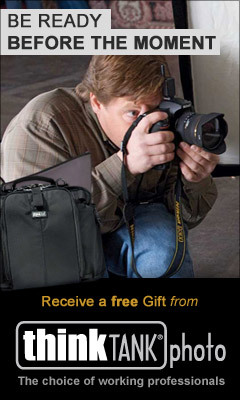 We love thinkTankphoto bags. Always comfortable, always well built, always slick and professional and fulfilling the needs we have. So if you’re on the look out for a new backpack, this could be the one for you. If the Trifecta sounds good to you, head on over to thinkTankphoto’s website now to find out more (and buy if you’re in the US). Want the fancy details? Find them below! •	Contoured back panel provides targeted cushioning as well as overall breathability. •	Internal organizer pockets give you quick access to filters, batteries, cards, etc. •	Trifecta 8 Mirrorless Backpack: 1 medium to large Mirrorless body with lens attached, 2–5 additional lenses, up to an 8” tablet, plus personal gear. Examples include a Sony a7 with 70–200mm f/4 attached, 24–70mm f/4, 16–35mm f/4, and an iPad mini or a Canon Rebel t5i with a 55–250mm f/4–5.6 attached, 10–18mm f/4.5–5.6 IS,18–55mm f/3.5–5.6, 50mm f/1.8, and an iPad mini. •	Trifecta 10 DSLR Backpack: 1 standard size DSLR body with lens attached, 2–4 additional lenses, up to a 10” tablet, plus personal gear. Examples include a Nikon D810 with 70–200 f/2.8 attached, 24–70 f/2.8, 14–24mm f/2.8 and an iPad or a Canon 5DMIII with 100mm f/2.8L macro attached, 85mm f/1.2L, 50mm f/1.2L, 35mm f/1.4L, 24mm f/1.4L and an iPad. Exterior: for superior water-resistance, all exterior fabric has a durable water-repellant (DWR) coating, plus the underside of the fabric has a polyurethane coating. It also has 600D twill, YKK® RC fuse zippers, 420D high-density nylon, ultra-stretch mesh, nylon webbing, nylon air-mesh, 3-ply bonded nylon thread.